Blair Trewin is a wonderful character and one of the leading researchers of the homogenization community. He works at the Australian Bureau of Meteorology (BOM) and created their high-quality homogenized datasets. He also developed a correction method for daily temperature observations that is probably the best we currently have. Fitting to his scientific love of homogenization, he has gone on a quest to visit all 112 weather stations that are used to monitor the Australian climate. Enjoy the BOM blog post on this "epic journey". You can read the rest of this adventure at the Blog of the Australian Bureau of Meteorology. In its time it was huge progress that Francis Bacon stressed the importance of observations. Even if he did not do that much science himself, his advocacy for the Baconian (scientific) method, gave him a place as one of the fathers of modern science together with Nicolaus Copernicus and Isaac Newton. However, you can also become too fundamentalist about empiricism. Modern science is characterized by an intricate interplay of observations and theory. An observation is never free of theory. You may not be aware of it, but you make theoretical assumptions about what you see in any observation. Theory also guides what to observe, what kind of experiments to make. Let theory guide your observations, but till your reputation is well established be sparing in publishing theory. It makes persons doubt your observations. They quote this when the observations show less changes than the model. If the observations show more changes than the model/theory the observations, they quickly forget Einstein and the observations are suddenly wrong. In practice Einstein was more realistic. Prof in molecular physics [[John Rigden]] wrote in his book about Einstein's wonder year 1905: "Einstein saw beyond common sense and, while he respected experimental data, he was not its slave." That is perfectly reasonable. When theory and observations do not match, the theory can be wrong, the observations can be wrong and the comparison can be wrong. What is called observations is nearly always something that was computed from observations and also that computation can be imperfect. Only when we understand the reason, can we say what it was. The main blog of the mitigation skeptical movement, WUWT, on the other hand is famous for calling trying to understand the reasons for discrepancies: "excuses". That was a long introduction to get to the graph I wanted to show, where theory suggests the global mean temperature estimates in some periods may have problems. 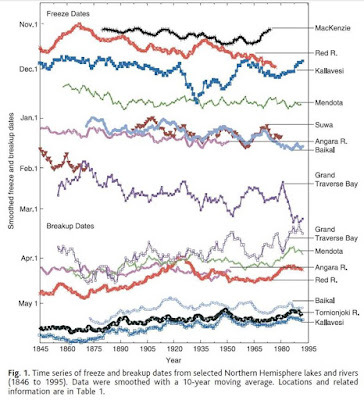 The graph was computed by Andrew Poppick and colleagues[, now published in Advances in Statistical Climatology, Meteorology and Oceanography] and it looks as if the manuscript is not published yet. They model the temperature for the instrumental period based on the known human forcings — mainly increases in greenhouse gasses and aerosols (small airborne particles from combustion) — and natural forcings — volcanoes and solar variations. The blue line is the model, the grey line the temperature estimate from NASA GISS (GISTEMP). The fit is astonishing. There are two periods, however, where the fit could be better: world war II and the first 40 to 50 years. So either the theory (this statistical model) is incomplete or the observations have problems. It is expected that the observations in the WWII are more uncertain. Especially the sea surface temperature changes are hard to estimate because the type of ships and thus the type of observations changed radically in this period. The HadSST estimate of the measurement methods is shown below. During WWII American war ships dominated and they mainly used Engine Room Intake observations, whereas before and after the war merchant ship would often measure the temperature of a bucket of sea water. The figure above are the observational methods estimated by the UK Hadley Centre for HadSST. Poppick's manuscript uses GISTEMP. Its sea surface temperature comes from ERSST v4. (The land data of GISTEMP comes from the stations gathered by NOAA (GHCNv3) and additional Antarctic stations). ERSST estimates the observational methods of ships by comparing the sea surface temperature to the night marine air temperature (NMAT). This relationship is only stable over larger areas and multiple years. They can thus not follow the fast changes in the WWII observational methods well. Also for HadSST it is not clear whether these corrections are accurate and they are large: in the order of 0.3°C. What makes this assessment more difficult is that in the beginning of WWII there was a strong and long [[El Nino event]]. Thus a bit of a peak is expected, but it is not clear whether the size is right. I would not mind if a reviewer would request to add a statistical model that includes El Nino as predictor in Poppick's paper. That would reduce the noise further (part of the remaining noise is likely explained by El Nino) and that would make it easier to assess how well the temperature fits in the WWII. 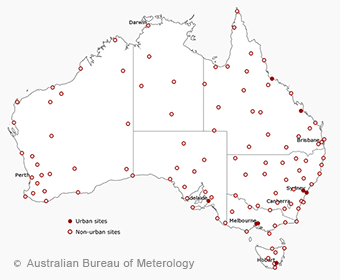 The Southern Oscilation Index (SOI) of the Australian Bureaux of Meteorology (BOM). Zoomed in to show the period around WWII. Values below -7 indicate El Nino events and above +7 La Nina events. It would be an important question to resolve. 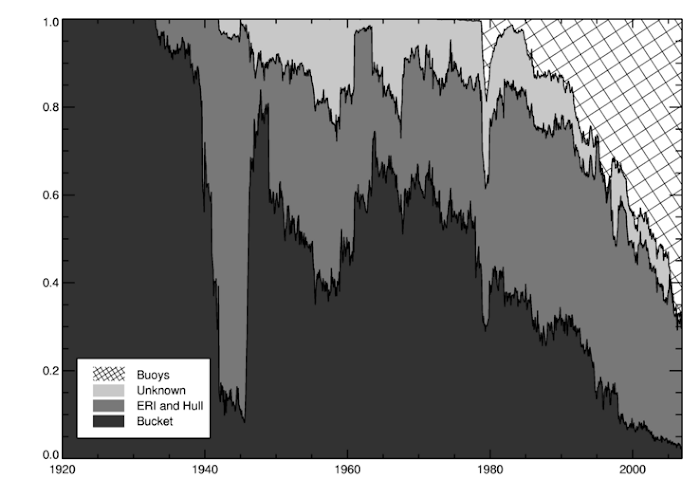 The peak in the WWII is a large part of the hiatus (a real one) we see in the period 1940 to 1980. If you think the peak in the 1940s away, this hiatus is a lot smaller. The lack of warming in this period is typically explained with increases in aerosols. It ended when air pollution regulations slowed the growth of aerosols; especially in the industrialised air quality improved a lot. I guess that if this peak is smaller, that would indicate that the influence of aerosols is smaller than we currently think. While the observations hardly showed any warming the first 40 to 50 years, the statistical model suggests that there should have been some warming. The global climate models also suggest some warming. And also several other climate variables suggest warming: the warming in winter, the time lakes and rives freeze and break up, the retreat of glaciers, temperature reconstructions from proxies, and possibly sea level rise. 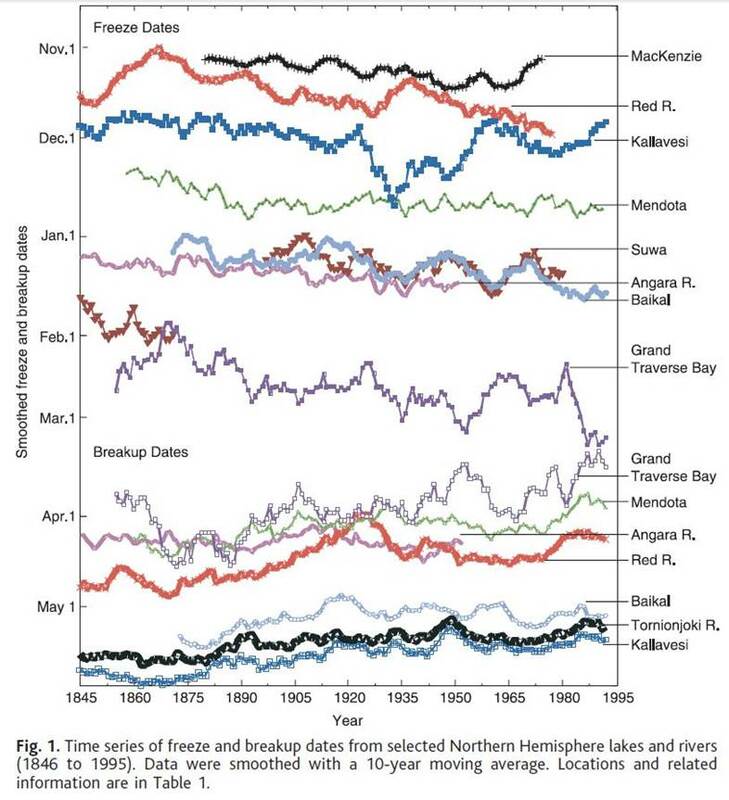 See for example this graph of the dates rivers and lakes froze up and broke up. I wrote about these changes in my previous post on "early global warming". Poppick's statistical model adds another piece of evidence and suggests that we should have a look whether we understand the measurement problems in the early data well enough. By comparing the observations with the statistical model we can see periods in which the fit is bad. Whether the long-term observed trend is right cannot be seen this way because the statistical model would still fit well, just with a different coefficient for the long-term forcings. This relationship is likely biased in a similar way as the simple statistical models used to estimate the equilibrium climate sensitivity from observations. This model, and thus theory, does provide a beautiful sanity check on the quality of the observations and suggests periods which we may need to study better. A large discontinuity in the mid-twentieth century in observed global-mean surface temperature. Nature, 453, pages 646–649, doi: 10.1038/nature06982. 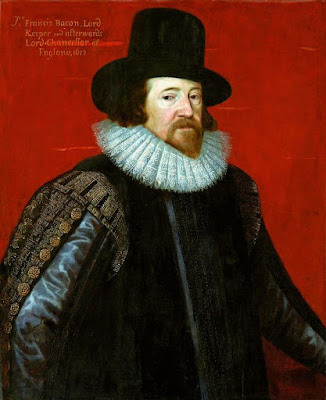 * Portrait of Francis Bacon at the top is taken from Wikipedia and is in the public domain. This blog is not called Variable Variability for nothing. Variability is the most fascinating aspect of the climate system. Like a fractal you can zoom in and out of a temperature signal and keep on finding interesting patterns. The same goes for wind, humidity, precipitation and clouds. This beauty was one of the reasons why I changed from physics to the atmospheric sciences, not being aware at the time that also physicists had started studying complexity. There is variability on all spatial scales, from clusters of cloud droplets to showers, fronts and depressions. There is variability on all temporal scales. With a fast thermometer you can see temperature fluctuations within a second and the effect of clouds passing by. Temperature has a daily cycle, day to day fluctuations, seasonal fluctuations and year to year fluctuations and so on. Also the fluctuations fluctuate. Cumulus fields may contain young growing clouds with a lot of variability, older smoother collapsing clouds and a smooth haze in between. Temperature fluctuations are different during the night when the atmosphere is stable, after sun rise when the sun heats the atmosphere from below and the summer afternoon when thermals develop and become larger and larger. The precipitation can come down as a shower or as drizzle. This makes measuring the atmosphere very challenging. If your instrument is good at measuring details, such as a temperature or cloud water probe on an aircraft, you will have to move it to get a larger spatial overview. The measurement will have to be fast because the atmosphere is changing continually. You can also select an instrument that measures large volumes or areas, such as a satellite, but then you miss out on much of the detail. A satellite looking down on a mountain may measure the brightness of some mixture of the white snow-capped mountains, dark rocks, forests, lush green valleys with agriculture and rushing brooks. The same problem happens when you model the atmosphere. A typical global atmospheric oceanic climate model has a resolution of about 50 km. Those beautiful snow-capped mountains outside are smoothed to fit into the model and may have no snow any more. If you want to study how mountain glaciers and snow cover feed the rivers you can thus not use the simulation of such a global climate model directly. You need a method to generate a high resolution field from the low resolution climate model fields. This is called downscaling, a beautiful topic for fans of variability. For the above mountain snow problem, a simple downscaling method would take a high-resolution height dataset of the mountain and make the higher parts colder and the lower parts warmer. How much exactly, you can estimate from a large number of temperature measurements with weather balloons. However, it is not always colder at the top. On cloud-free nights, the surface rapidly cools and in turn cools the air above. This cold air flows down the mountain and fills the valleys with cold air. Thus the next step is to make such a downscaling method weather dependent. Such direct relationships between height and temperature are not always enough. This is best seen for precipitation. When the climate model computes that it will rain 1 mm per hour, it makes a huge difference whether this is drizzle everywhere or a shower in a small part of the 50 times 50 km box. The drizzle will be intercepted by the trees and a large part will evaporate quickly again. The drizzle that lands on the ground is taken up and can feed the vegetation. Only a small part of the heavy shower will be intercepted by trees, most of it will land on the ground, which can only absorb a small part fast enough and the rest runs over the land towards brooks and rivers. Much of the vegetation in this box did not get any water and the rivers swell much faster. In the precipitation example, it is not enough to give certain regions more and others less precipitation, the downscaling needs to add random variability. How much variability needs to be added depends on the weather. On a dreary winters day the rain will be quite uniform, while on a sultry summer evening the rain more likely comes down as a strong shower. There are many downscaling methods. This is because the aims of the downscaling depend on the application. Sometimes making accurate predictions is important; sometimes it is important to get the long-term statistics right; sometimes the bias in the mean is important; sometimes the extremes. For some applications it is enough to have data that is locally realistic, sometimes also the spatial patterns are important. Even if the aim is the same, downscaling precipitation is very different in the moderate European climate than it is in the tropical simmering pot. With all these different aims and climates, it is a lot of work to develop and test downscaling methods. We hope that we can automate a large part of this work using machine learning: Ideally we only set the aims and the computer develops the downscaling method. We do this with a method called "Genetic Programming", which uses a computational approach that is inspired by the evolution of species (Poli and colleagues, 2016). Every downscaling rule is a small computer program represented by a tree structure. The main difference from most other optimization approaches is that GP uses a population. Every downscaling rule is a member of this population. The best members of the population have the highest chance to reproduce. When they cross-breed, two branches of the tree are exchanged. When they mutate, an old branch is substituted by a new random branch. It is a cartoonish version of evolution, but it works. We have multiple aims, we would like the solution to be accurate, we would like the variability to be realistic and we would like the downscaling rule to be small. You can try to combine all these aims into one number and then optimize that number. This is not easy because the aims can conflict. 1. A more accurate solution is often a larger solution. 2. Typically only a part of the small-scale variability can be predicted. A method that only adds this predictable part of the variability, would add too little variability. If you would add noise to such a solution, its accuracy goes down again. Instead of combining all aims into one number we have used the so-called “Pareto approach”. What a Pareto optimal solution is is best explained visually with two aims, see the graphic below. The square boxes are the Pareto optimal solutions. The dots are not Pareto optimal because there are solutions that are better for both aims. The solutions that are not optimal are not excluded: We work with two populations: a population of Pareto optimal solutions and a population of non-optimal solutions. The non-optimal solutions are naturally less likely to reproduce. Example of a Pareto optimization with two aims. The squares are the Pareto optimal solutions, the circles the non-optimal solutions. Figure after Zitzler and Thiele (1999). We have the impression that this Pareto approach has made it possible to solve a quite complicated problem. Our problem was to downscale the fields near the surface of an atmospheric model before they are passed to a model for the surface (Zerenner and colleagues, 2016; Schomburg and colleagues, 2010). These were, for instance, fields of temperature, wind speed. The atmospheric model we used is the weather prediction model of the German weather service. It has a horizontal resolution of 2.8 km and computes the state of the atmosphere every few seconds. We run the surface model TERRA at 400 m resolution. Below every atmospheric column of 2.8x2.8 km, there are 7x7 surface pixels. The spatial variability of the land surface can be huge; there can be large differences in height, vegetation, soil type and humidity. It is also easier to run a surface model at a higher spatial resolution because it does not need to be computed so often, the variations in time are smaller. To be able to make downscaling rules, we needed to know how much variability the 400x400 m atmospheric fields should have. We study this using a so-called training dataset, which was made by making atmospheric model runs with 400 m resolution for a smaller than usual area for a number of days. This would be too much computer power for a daily weather prediction for all of Germany, but a few days on a smaller region are okay. An additional number of 400 m model runs was made to be able to validate how well the downscaling rules work on an independent dataset. The figure below shows an example for temperature during the day. The panel to the left shows the coarse temperature field after smoothing it with a spline, which preserves the coarse scale mean. The panel in the middle shows the temperature field after downscaling with an example downscaling rule. This can be compared to the 400 m atmospheric field the coarse field was originally computed from on the right. During the day, the downscaling of temperature works very well. The figure below is the temperature field at night during a clear sky night. This is a difficult case. On cloud-free nights the air close to the ground cools and gathers in the valleys. These flows are quite close to the ground, but a good rule was to take the temperature gradient in the lower model layers and multiply it with the height anomalies (height differences from spline-smoothed coarse field). Having a population of Pareto optimal solutions is one advantage of our approach. There is normally a trade of between the size of the solution and its performance and having multiple solutions means that you can study this and then chose a reasonable compromise. Contrary to working with artificial neural networks as machine learning method, the GP solution is a piece of code, which you can understand. You can thus select a solution that makes sense physically and thus more likely works as well in situation that are not in the training dataset. You can study the solutions that seem strange and try to understand why they work and gain insight into your problem. This statistical downscaling as an interface between two physical models is a beautiful synergy of statistics and physics. Physics and statistics are often presented at antagonists, but they actually strength each other. Physics should inform your statistical analysis and the above is an example where statistics makes a physical model more realistic (not performing a downscaling is also a statistical assumption, just less visible and less physical). I would even argue that the most interesting current research in the atmospheric sciences merges statistics and physics: ensemble weather prediction and decadal climate prediction, bias corrections of such ensembles, model output statistics, climate model emulators, particle assimilation methods, downscaling global climate models using regional climate models and statistical downscaling, statistically selecting representative weather conditions for downscaling with regional climate models and multivariate interpolation. My work on adaptive parameterisation combining the strengths of more statistical parameterisations with more physical parameterisations is also an example. Poli, R., W.B. Langdon and N. F. McPhee, 2016: A field guide to genetic programming. Published via Lulu.com (With contributions by J. R. Koza). Schomburg, A., V.K.C. Venema, R. Lindau, F. Ament and C. Simmer, 2010: A downscaling scheme for atmospheric variables to drive soil-vegetation-atmosphere transfer models. Tellus B, doi: 10.1111/j.1600-0889.2010.00466.x, 62, no. 4, pp. 242-258. Zerenner, Tanja, Victor Venema, Petra Friederichs and Clemens Simmer, 2016: Downscaling near-surface atmospheric fields with multi-objective Genetic Programming. Environmental Modelling & Software, in press. Zitzler, Eckart and Lothar Thiele, 1999: Multiobjective evolutionary algorithms: a comparative case study and the strength Pareto approach. IEEE transactions on Evolutionary Computation 3.4, pp. 257-271, 10.1109/4235.797969. * Sierpinski fractal at the top was generated by Nol Aders and is used under a GNU Free Documentation License. 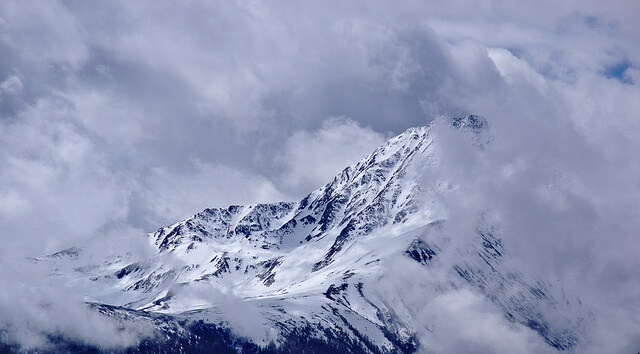 * Photo of mountain with clouds all around it (Cloud shroud) by Zoltán Vörös and is used under a Creative Commons Attribution 2.0 Generic (CC BY 2.0) license. Listen to grumpy old men. As a young cloud researcher at a large conference, enthusiastic about almost any topic, I went to a town-hall meeting on using a large number of climate model runs to study how well we know what we know. Or as scientists call this: using a climate model ensemble to study confidence/uncertainty intervals. Using ensembles was still quite new. Climate Prediction dot Net had just started asking citizens to run climate models on their Personal Computers (old big iPads) to get the computer power to create large ensembles. Studies using just one climate model run were still very common. The weather predictions on the evening television news were still based on one weather prediction model run; they still showed highs, lows and fronts on static "weather maps". During the questions, a grumpy old men spoke up. He was far from enthusiastic about his new stuff. I see a Statler or Waldorf angrily swing his wooden walking stick in the air. He urged everyone, everyone to be very careful and not to equate the ensemble with a sample from a probability distribution. The experts dutifully swore they were fully aware of this. They likely were and still are. But now everyone uses ensembles. Often using them as if they sample the probability distribution. Before I wrote about the problems confusing model spread and uncertainty made in the now mostly dead "hiatus" debate. That debate remains important: after the hiatus debate is before the hiatus debate. The new hiatus is already 4 month old. * And there are so many datasets to select a "hiatus" from. Fyfe et al. (2013) compared the temperature trend from the CMIP ensemble (grey histogram) to observations (red something) implicitly assuming that the model spread is the uncertainty. While the estimated trend is near the model spread, it is well within the uncertainty. The right panel is for a 20 year period: 1993–2012. The left panel starts in the cherry picked large El Nino year: 1998–2012. This time I would like to explain better why the ensemble model spread is typically smaller than the confidence interval. These reasons suggest other questions where we need to pay attention: It is also important for comparing long-term historical model runs with observations and could affect some climate change impact studies. For long-term projections and decadal climate prediction it is likely less relevant. One climate model run is just one realisation. Reality has the same problem. But you can run a model multiple times. If you change the model fields you begin with just a little bit, due to the chaotic nature of atmospheric and oceanic flows a second run will show a different realisation. The highs, lows and fronts will move differently, the ocean surface is consequently warmed and cooled at different times and places, internal modes such as El Nino will appear at different times. This chaotic behaviour is mainly found at the short time scales and is one reason for the spread of an ensemble. And it is one reason to expect that model spread is not uncertainty because models focus on getting the long term trend right and differ strongly when it comes to the internal variability. But that is just reason one. The modules of a climate model that simulate specific physical processes have parameters that are based on measurements or more detailed models. We only know these parameters within some confidence interval. A normal climate model takes the best estimate of these parameters, but they could be anywhere within the confidence interval. To study how important these parameters are special "perturbed physics" ensembles are created where every model run has parameters that vary within the confidence interval. Creating a such an ensemble is difficult. Depending on the reason for the uncertainty in the parameter, it could make sense to keep its value constant or to continually change it within its confidence interval and anything in between. It could make sense to keep the value constant over the entire Earth or to change it spatially and again anything in between. The parameter or how much it can fluctuate may dependent on the local weather or climate. It could be that parameter X is high also parameter Y is high (or low); these dependencies should also be taken into account. Finally, also the distributions of the parameters needs to be realistic. Doing all of this for the large number of parameters in a climate model is a lot of work, typically only the most important ones are perturbed. You can generate an ensemble that has too much spread by perturbing the parameters too strongly (and by making the perturbations too persistent). If you do it optimally, the ensemble would still show too little spread because not all physical processes are modelled because they are thought not to be important enough to justify the work and the computational resources. Part of this spread can be studied by making ensembles using many different models (multi-model ensemble), which are developed by different groups with different research questions and different ideas what is important. That is where the title comes in: ensembles of opportunity. These are ensembles of existing model runs that were not created to be an ensemble. The most important example is the ensemble of the Coupled Models Intercomparison Project (CMIP). This group coordinates the creating of a set of climate model runs for similar scenarios, so that the results of these models can be compared with each other. This ensemble will automatically sample the chaotic flows and it is a multi-model ensemble, but it is not a perturbed physics ensemble; these model runs are model aiming at the best possible reproduction of what happened. For this reason alone the spread of the CMIP ensemble is expected to be too low. The term "ensembles of opportunity" is another example the tendency of natural scientists to select neutral or generous terms to describe the work of colleagues. The term "makeshift ensemble" may be clearer. There is a broad spectrum of methods to improve model match to 20th century warming, ranging from simply choosing to no longer modify the value of a sensitive parameter when a match is already good for a given model, or selecting physical parameterizations that improve the match, to explicitly tuning either forcing or feedback both of which are uncertain and depend critically on tunable parameters (Murphy et al. 2004; Golaz et al. 2013). Model selection could, for instance, consist of choosing to include or leave out new processes, such as aerosol cloud interactions, to help the model better match the historical warming, or choosing to work on or replace a parameterization that is suspected of causing a perceived unrealistically low or high forcing or climate sensitivity. Due to tuning models that have a low climate sensitivity tend to have stronger forcings over the last century and model with a high climate sensitivity a weaker forcing. The forcing due to greenhouse gasses does not vary much, that part is easy. The forcings due to small particles in the air (aerosols) that like CO2 stem from the burning of fossil fuels and are quite uncertain and Kiehl (2007) showed that high sensitivity models tend to have more cooling due to aerosols. For a more nuanced updated story see Knutti et al. (2008) and Forster et al. (2013). Kiehl (2007) found an inverse correlation between forcing and climate sensitivity. The main reason for the differences in forcing was the cooling by aerosols. This "tuning" initially was not an explicit tuning of model parameters, but mostly because modellers keep working until the results look good. Look good compared to observations. Bjorn Stevens talks about this in an otherwise also recommendable Forecast episode. Nowadays the tuning is often performed more formally and an important part of studying the climate models and understanding their uncertainties. The BAMS article proposes to collect information on tuning for the upcoming CMIP. In principle a good idea, but I do not think that that is enough. In a simple example of climate sensitivity and aerosol forcing, the groups with low sensitivity and forcing and the ones with high sensitivity and forcing are happy with their temperature trend and will report not to have tuned. But that choice also leads to too little ensemble spread, just like the groups that did need to tune. Tuning makes it complicated to interpret the ensemble, it is no problem for a specific model run. Given that we know the temperature increase, it is impossible not to get a tuned result. Furthermore, I mention several additional reasons why the model spread is not the uncertainty above that complicate the interpretation of the ensemble in the same way. A solution could be to follow the work in ensemble weather prediction with perturbed-physics ensembles and to tune all models, but to tune them to cover the full range of uncertainties that we estimate from the observations. This should at least cover the the climate sensitivity and ocean heat uptake, but preferably also other climate characteristics that are important for climate impact and climate variability studies. Large modelling centres may be able to create such large ensembles by themselves, the others could coordinate their work in CMIP to make sure the full uncertainty range is covered. Because the physics is not perturbed and especially due to the tuning, you would expect that the CMIP ensemble spread is too low for global mean temperature increase. That the CMIP ensemble average fits well to the observed temperature increase shows that with reasonable physical choices we can understand why the temperature increased. It shows that known processes are sufficient to explain it. That is fits so accurately, does not say much. I liked the title of an article from Reto Knutti (2008): "Why are climate models reproducing the observed global surface warming so well?" Which implies it all. Much more interesting to study how good models are, are spatial patterns and other observations. New datasets are greeted with much enthusiasm by modellers because they allow for the best comparison and are more likely to show new problems that need fixing and lead to a better understanding. Also model results for the deep past are important tests, which models are not tuned for. When the observations peak out of this too narrow CMIP ensemble spread that is to be expected. If you want to make a case that our understanding does not fit to the observations, you have to take the uncertainties into account, not the spread. Similarly, that the CMIP ensemble mean fits to the observations is no reason to expect that the observations are reliable. Because of the overconfidence in the data quality also many scientists took the recent minimal deviations from the trend line too seriously. This finally stimulated more research into the accuracy of temperature trends, into inhomogeneities in the ERSST sea surface temperatures, into the effect of coverage and how we blend sea, land and ice temperatures together. There are some more improvements under way. Compared to the global warming of about 1°C up to now, these recent and upcoming corrections are large. Many of the problem could have been found long ago. It is 2016. It is about time to study this. If funding is an issue we could maybe sacrifice some climate change impact studies for wine. Or for truffles. Or caviar. The quality of our data is the foundation of our science. That the comparison of the CMIP ensemble average with the instrumental observation is so central to the public climate "debate" is rather ironic. Please take a walk in the forest. Look at all the different changes. The ones that go slower as well as the many that go faster than expected. Maybe it is good to emphasise that for the attribution of climate change to human activities, the size of the historical temperature increase is not used. The attribution is made via correlations with the 3-dimensional spatial patterns between observations and models. By using the correlations (rather than root mean square errors), the magnitude of the change in either the models or the observations is no longer important. Ribes (2016) is working on using the magnitude of the changes as well. This is difficult because of inevitable tuning, which makes specifying the uncertainties very difficult. Studying the impacts of climate change is hard. Whether dikes break depends not only on sea level rise, but also on the changes in storms. The maintenance of the dikes and the tides are important. It matters whether you have a functioning government that also takes care of problems that only become apparent when the catastrophe happens. I would not sleep well if I lived in an area where civil servants are not allowed to talk about climate change. Because of the additional unnecessary climate dangers, but especially because that is a clear sign of a dysfunctional government that does not prioritise protecting its people. The too narrow CMIP ensemble spread can lead to underestimates of the climate change impacts because typically the higher damages from stronger than expected changes are larger than the reduced damages from smaller changes. The uncertainty monster is not our friend. Admittedly, the effect of the uncertainties is rather modest. This this is only important for those impacts we understand reasonably well already. The lack of variability can be partially solved in the statistical post-processing (bias correction and downscaling). This is not common yet, but Grenier et al. (2015) proposed a statistical method to make the natural variability more realistic. This problem will hopefully soon be solved when the research programs on decadal climate prediction mature. The changes over a decade due to greenhouse warming are modest, for decadal prediction we thus especially need to accurately predict the natural variability of the climate system. An important part of these studies is assessing whether and which changes can be predicted. As a consequence there is a strong focus on situation specific uncertainties and statistical post-processing to correct biases of the model ensemble in the means and in the uncertainties. In the tropics decadal climate prediction works reasonably well and helps farmers and governments in their planning. In the mid-latitudes, where most of the researchers live, it is frustratingly difficult to make decadal predictions. Still even in that case, we would still have an ensemble where the ensemble can be used as a sample of the probability distribution. That is important progress. When a lack of ensemble spread is a problem for historical runs, you might expect it to be a problem for projecting for the rest of the century. This is probably not the case. The problem of tuning would be much reduced because the influence of aerosols will be much smaller as the signal of greenhouse gasses becomes much more dominant. For long term projections the main factor is that the climate sensitivity of the models needs to fit to our understanding of the climate sensitivity from all studies. This fit is reasonable for the best estimate of the climate sensitivity, which we expect to be 3°C for a doubling of the CO2 concentration. I do not know how well the fit is for the spread in the climate sensitivity. However, for long-term projections even the climate sensitivity is not that important. For the magnitude of the climatic changes in 2100 and for the impact of climate change in 2100, the main source of uncertainty is what we will do. As you can see in the figure below the difference between a business as usual scenario and strong climate policies is 3 °C (6 °F). The uncertainties within these scenario's is relatively small. Thus the main question is whether and how aggressively we will act to combat climate change. New article (september 2017): Gavin Schmidt et al. : Practice and philosophy of climate model tuning across six US modeling centers. Discussion paper suggesting a path to solving the difference between model spread and uncertainty by James Annan and Julia Hargreaves: On the meaning of independence in climate science. Fans of Judith Curry: the uncertainty monster is not your friend. Forecast: Gavin Schmidt on the evolution, testing and discussion of climate models. Forecast: Bjorn Stevens on the philosophy of climate modeling. The Guardian: In a blind test, economists reject the notion of a global warming pause. Forster, P.M., T. Andrews, P. Good, J.M. Gregory, L.S. Jackson, and M. Zelinka, 2013: Evaluating adjusted forcing and model spread for historical and future scenarios in the CMIP5 generation of climate models. Journal of Geophysical Research, 118, 1139–1150, doi: 10.1002/jgrd.50174. Fyfe, John C., Nathan P. Gillett and Francis W. Zwiers, 2013: Overestimated global warming over the past 20 years. Nature Climate Change, 3, pp. 767–769, doi: 10.1038/nclimate1972. Golaz, J.-C., J.-C. Golaz, and H. Levy, 2013: Cloud tuning in a coupled climate model: Impact on 20th century warming. Geophysical Research Letters, 40, pp. 2246–2251, doi: 10.1002/grl.50232. Grenier, Patrick, Diane Chaumont and Ramón de Elía, 2015: Statistical adjustment of simulated inter-annual variability in an investigation of short-term temperature trend distributions over Canada. EGU general meeting, Vienna, Austria. Hourdin, Frederic, Thorsten Mauritsen, Andrew Gettelman, Jean-Christophe Golaz, Venkatramani Balaji, Qingyun Duan, Doris Folini, Duoying Ji, Daniel Klocke, Yun Qian, Florian Rauser, Cathrine Rio, Lorenzo Tomassini, Masahiro Watanabe, and Daniel Williamson, 2016: The art and science of climate model tuning. Bulletin of the American Meteorological Society, published online, doi: 10.1175/BAMS-D-15-00135.1. Kiehl, J.T., 2007: Twentieth century climate model response and climate sensitivity. Geophysical Research Letters, 34, L22710, doi: 10.1029/2007GL031383. Knutti, R., 2008: Why are climate models reproducing the observed global surface warming so well? Geophysical Research Letters, 35, L18704, doi: 10.1029/2008GL034932. Murphy, J.M., D.M.H. Sexton, D.N. Barnett, G.S. Jones, M.J. Webb, M. Collins and D.A. Stainforth, 2004: Quantification of modelling uncertainties in a large ensemble of climate change simulations. Nature, 430, pp. 768–772, doi: 10.1038/nature02771. Ribes, A., 2016: Multi-model detection and attribution without linear regression. 13th International Meeting on Statistical Climatology, Canmore, Canada. Abstract below. Rowlands, Daniel J., David J. Frame, Duncan Ackerley, Tolu Aina, Ben B. B. Booth, Carl Christensen, Matthew Collins, Nicholas Faull, Chris E. Forest, Benjamin S. Grandey, Edward Gryspeerdt, Eleanor J. Highwood, William J. Ingram, Sylvia Knight, Ana Lopez, Neil Massey, Frances McNamara, Nicolai Meinshausen, Claudio Piani, Suzanne M. Rosier, Benjamin M. Sanderson, Leonard A. Smith, Dáithí A. Stone, Milo Thurston, Kuniko Yamazaki, Y. Hiro Yamazaki & Myles R. Allen, 2012: Broad range of 2050 warming from an observationally constrained large climate model ensemble. Nature Geoscience, 5, pp. 256–260, doi: 10.1038/ngeo1430 (manuscript). Abstract. Conventional D&A statistical methods involve linear regression models where the observations are regressed onto expected response patterns to different external forcings. These methods do not use physical information provided by climate models regarding the expected response magnitudes to constrain the estimated responses to the forcings. As an alternative to this approach, we propose a new statistical model for detection and attribution based only on the additivity assumption. We introduce estimation and testing procedures based on likelihood maximization. As the possibility of misrepresented response magnitudes is removed in this revised statistical framework, it is important to take the climate modelling uncertainty into account. In this way, modelling uncertainty in the response magnitude and the response pattern is treated consistently. We show that climate modelling uncertainty can be accounted for easily in our approach. We then provide some discussion on how to practically estimate this source of uncertainty, and on the future challenges related to multi-model D&A in the framework of CMIP6/DAMIP. * Because this is the internet, let me say that "The new hiatus is already 4 month old." is a joke. ** The BAMS article calls any way to estimate a parameter "tuning". I would personally only call it tuning if you optimize for emerging properties of the climate model. If you estimate a parameter based on observations or a specialized model, I would not call this tuning, but simply parameter estimation or parameterization development. Radiative transfer schemes use the assumption that adjacent layers of clouds are maximally overlapped and that if there is a clear layer between two cloud layers that they are random overlapped. You could introduce two parameters that vary between maximum and random for these two cases, but that is not done. You could call that an implicit parameter, which shows that distinguishing between parameter estimation and parameterization development is hard. 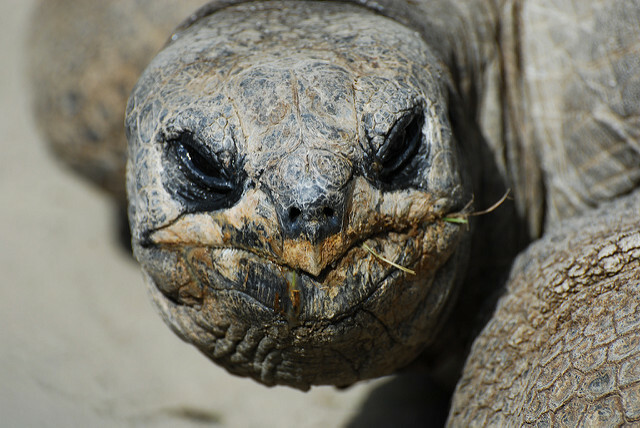 *** Photo at the top: Grumpy Tortoise Face by Eric Kilby, used under a Attribution-ShareAlike 2.0 Generic (CC BY-SA 2.0) license.